Albania hasn't had a monarch since World War II, but today at the Royal Palace in Tirana, the country witnessed the closest thing they've got to a royal wedding. Prince Leka, grandson of King Zog and Queen Geraldine, married Elia Zaharia, an Albanian actress. 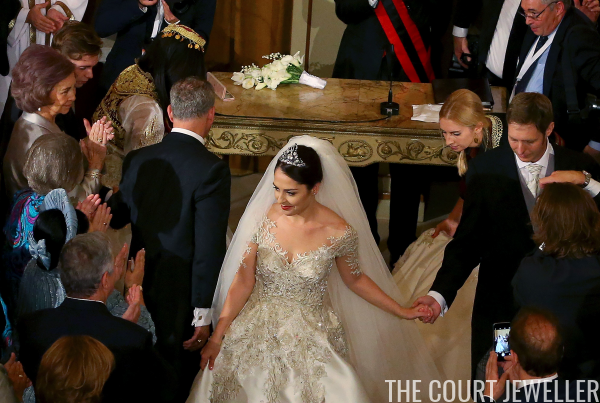 Elia wore an unusual tiara with a complicated family and national history for the occasion. 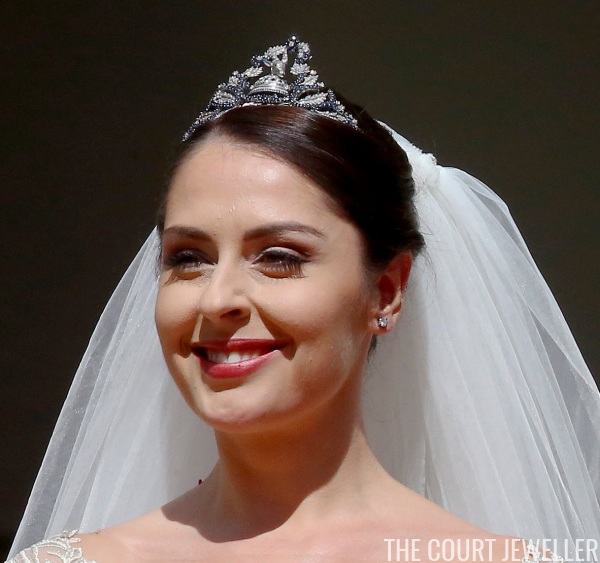 Here's a closer look at the diamond and sapphire tiara that Elia wore with her wedding gown. Looks unusual, hm? Can you make out the rather interesting diamond element in the middle? It's the Ram of Skanderbeg, a national symbol of Albania that is patterned after the unusual helmet above. The helmet originally belonged to Gjergj Kastrioti Skanderbeg, a famous fifteenth-century Albanian military hero, who sometimes styled himself "Lord of Albania." 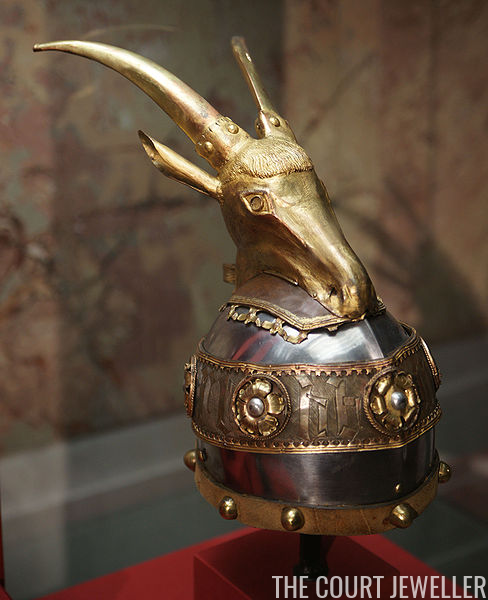 Today, the actual helmet (pictured above) is housed in a Viennese museum. The Ram is also a part of Albania's royal crest. Albania was only a kingdom for a very short time in the twentieth century, but clearly the royal family wanted to reach back into Albania's history to echo symbols of power and legitimacy. It feels a little strange to see grand royal jewelry set with such goat-like motifs, but it's all connected to that need to be seen as a part of the country's grand legacy. Above, you see an image of another family tiara that featured the Ram. This one was worn by the groom's grandmother, Queen Geraldine. Numerous other Albanian princesses wore ram tiaras, but most of their jewels, including Geraldine's tiara, were sold at auction in the 1950s. 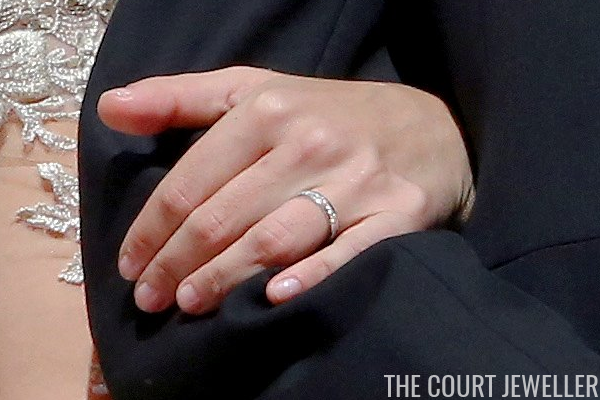 But the family has kept a suite of sapphire and diamond jewels. 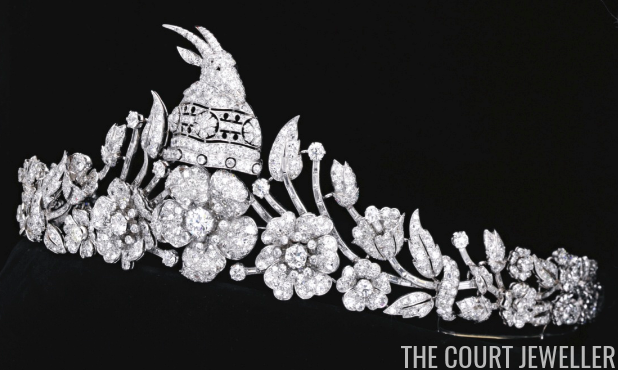 The tiara was worn by the groom's late mother, Susan, and today, it became a bridal diadem. The tiara also had a coordinating suite of sapphire and diamond jewels, but I believe those have also been sold. Elia wore the tiara with simple stud earrings -- which, of course, because what other jewelry can really compete with a diamond ram's head??? 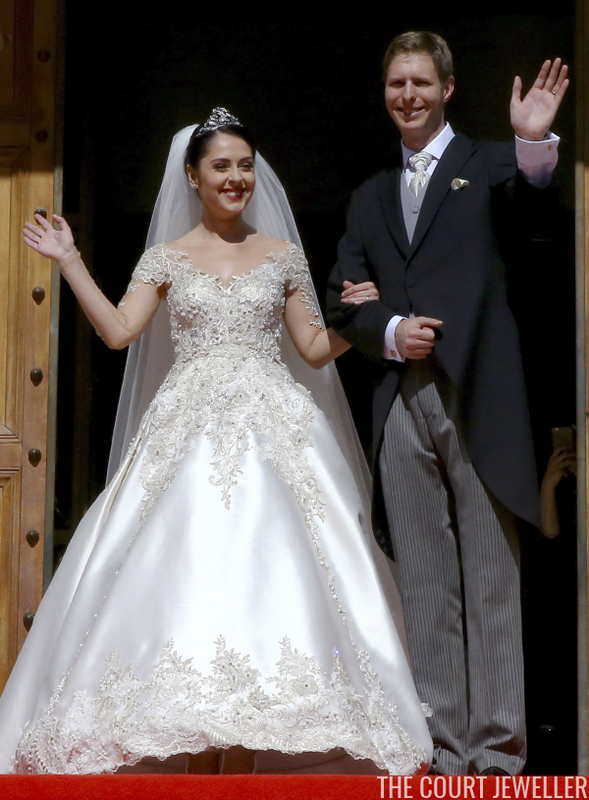 And a better look at her wedding gown. Although this was the wedding of a royal pretender, lots of royals, both reigning and non, gathered for the occasion. 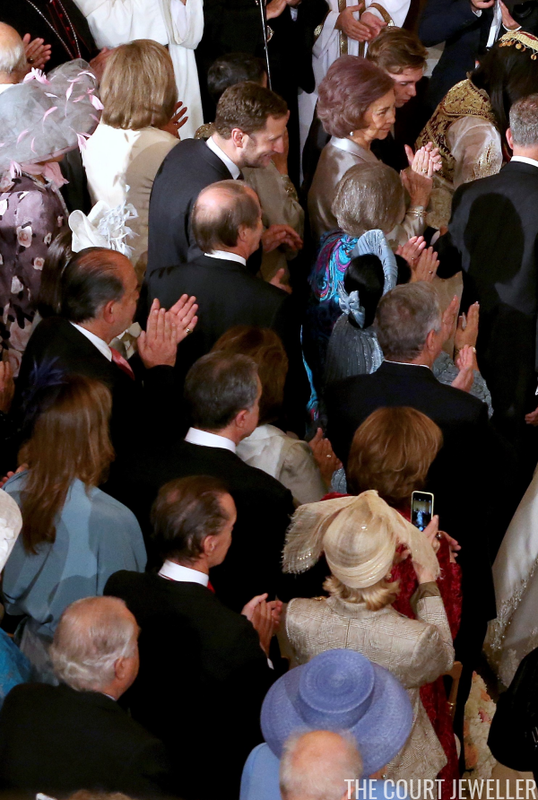 The photo above requires some back-of-the-head identification skills, but you can spot Queen Sofia of Spain with her sister, Princess Irene of Greece and Denmark; Georg Friedrich of Prussia; Margarita and Radu of Romania; Alexander and Katharine of Serbia; Maria Vladimirovna of Russia; and Duarte Pio and Isabel of Braganza, among others. Prince and Princess Michael of Kent were also in attendance, as were representatives from the reigning families of Liechtenstein and Luxembourg.